UNPO: Tibet: Is China’s Tibet Policy On The Road To Change? Tibet: Is China’s Tibet Policy On The Road To Change? In certain Tibetan regions, local authorities appeared to be allowing images of the Dalai Lama, the exiled Tibetan spiritual leader, to be openly venerated for religious purposes. The seeming policy shift in parts of Sichuan and Qinghai provinces with large Tibetan populations was seen as possible evidence of a gentler approach to the troubled region by the new Chinese Communist Party (CCP) chief Xi Jinping. Worshipping the Dalai Lama remains illegal in Tibetan areas of China, despite earlier reports of changes in China's policies in Lhasa and in some parts of neighboring Qinghai province. Free Tibet, a London-based advocacy group, said in a report Tuesday [2 July 2013] authorities in Qinghai province sent text messages to Tibetan residents, notifying them the ban on images of the Tibetan spiritual leader remains in effect. 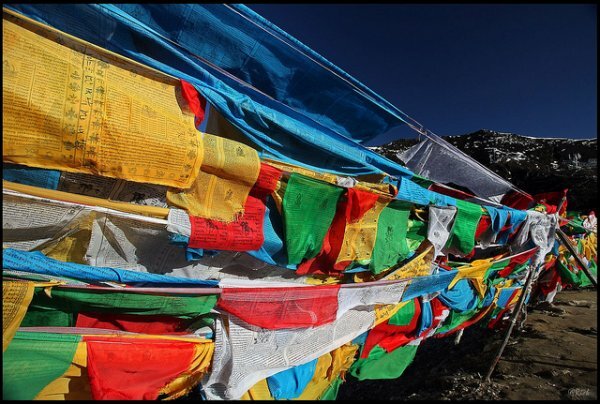 “We've had confirmed from several sources that this text message has been sent from the propaganda department in Qinghai in Tibetan language to Tibetans,” says Alistair Currie Free Tibet's media officer. China's State Bureau of Religious Affairs also denied any change in policy in a statement to the BBC. Since 1996, the central government has enforced a policy that forbids temples as well as hotels and restaurant from displaying photographs of Tibet's exiled spiritual leader. Last week, there were reports some monasteries were allowed to show the photographs or had held meetings to discuss lifting the ban. The reports prompted the State Bureau's response there has been no policy change. Chinese media outlets have been silent about the issue. Discussion of the issue was partly censored online Tuesday [2 July 2013]. Zhang Haiyang, director of the Ethnic Minority Study Center of China and the Minzu University in Beijing, says a colleague had sent him some information about the reports by text. He says that although he does not have any direct knowledge of the policy discussions among authorities in Tibetan regions, there is bound to be some divergence of views as to how to deal with Tibet. Monks, nuns and lay people have taken extreme measures to protest what they believe is China's oppressive rule on the region. Since 2009 at least 120 people have self-immolated, an act that authorities in Beijing believe as being inspired by the Dalai Lama and his “clique” in an attempt to split the region from China. Last month [June 2013], a professor at the Party School of the Central Committee of the Chinese Communist Party publicly broke away from the party orthodoxy on Tibet. Professor Jin Wei told a Hong Kong magazine that Beijing's attitudes towards the Dalai Lama - who is still highly revered inside Tibet - has an impact on how Tibetans respond to Chinese rule. “We cannot just simply treat and regard him as an enemy,” she told Asia Weekly. She also suggested that if negotiation goes well, the Dalai Lama might be allowed to move to Hong Kong, and even make trips back to Tibet. Scholars outside China have speculated whether there is support among the Chinese leadership for loosening Beijing’s hard line against the Dalai Lama. Thubten Sampel, the director of Tibet Policy Institute, a think tank of the Central Tibetan Administration based in Dharamshala, says that Jin's comments suggest an underlying dialogue on Tibet among senior Chinese leaders. At the same time, Thubten says that leaving things as they are - with unaddressed grievances prone to turn into unrest - is risky as well. Xi Jinping, who became China's president in March, has in the past made critical statements about “separatist activities” in Tibet, and analysts say he is unlikely to substantially veer from the hard-line policies of his predecessors.